Transience, ephemerality. There is beauty in things that don’t last. 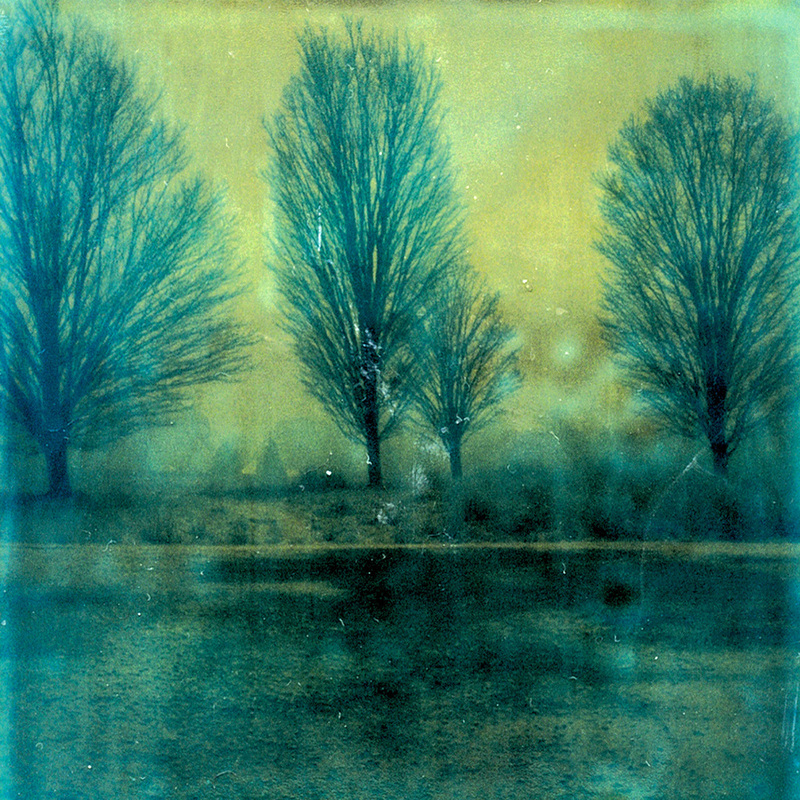 Taylor Deupree’s Snow (Dusk, Dawn), a multimedia project incorporating sound and photography, is based around 63 photographs taken with expired polaroid film. This particular film produces images cast with other-worldly blueish hues and almost immediately begin to fade; losing color, to deep browns, and then finally, within 24 hours after being shot, to complete black. Deupree’s work is often inspired by nature, particularly the winterscapes near his home and studio in rural New York. With the polaroid film in hand, which he knew would capture only a fleeting image, he shot images during the first heavy snowfall of the winter of 2009, at dusk, in the setting sun; nothing was to last, the snow, the image, the day. The next morning, barely at sunrise, he set out again to finish the film, in a dawn that wasn’t going to last. As quickly as he could, following each photo session, Deupree scanned the polaroid prints, capturing the first white snow in ghostly blue before the pictures faded to black. Each of these scanned images is printed and displayed next to its original, black polaroid counterpart in the package along with the cd. Each copy of this edition of 63 is thus rendered unique, each with a different print and polaroid. For the music portion of the project there is also contrast, transience, and decay. A fragile melodic loop, distressed by surface noise, struggles to keep its repetitive flow over a quiet and languid 18 minutes as it subtly, but constantly, loses ground and eventually becomes fragmented and falls away amongst the elements that surrounded it. Snow (Dusk, Dawn) captures the essence of what much of Deupree’s work is about: imperfection, time, and memory. He uses both high- and low-tech means of creating rich works that scrape away at the surface of digital sterility. Avoiding the con- trolled manipulation offered by computers he prefers natural and unpredictable processes to add depth and texture to this work. Outdated film, cheap cameras, dust and leaking light effect his photographs while guitars, found percussion, old analog synthesizers and recordings of falling snow provide the soundtrack to a moment in time that comes and goes like dawn.